IBM and the City of Melbourne have kicked off a three-year partnership with an interactive online hub and social analytics effort for this year’s Melbourne Spring Fashion Week (MSFW). The online hub aims to enhance the event for attendees, and marks the beginning of a three-year partnership between the City of Melbourne and IBM as the ‘Official Innovation and Technology Partner’ for MSFW. Social media analytics technology will provide insights for understanding sentiment around popular shows and events across MSFW, to help plan future events. IBM is working with the City of Melbourne throughout this year’s MSFW, which runs from 29 August to 7 September, to leverage the benefits of mobile devices, social media and data analytics technology for event goers. An interactive website, hosted on IBM Cloud, will enable consumers to plan their evening (using any device) by viewing the event schedule, plotting their shopping experience on a virtual map. The site will also allow them to receive event updates, retailer special offers and personalise their entire experience over the course of the event. IBM will use social media analytics technology to analyse online conversation across Twitter and Instagram throughout the whole event. The analysis will provide insights for City of Melbourne to understand sentiment around popular shows and events across Fashion Week, to help plan future events. 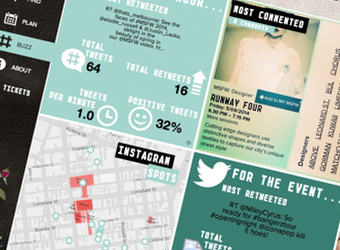 The real-time analysis will be available on melbournespringfashionweek.com.au for shoppers to see what’s trending.